The Motto That Didn't Make It! The words "In God We Trust" have appeared on U.S. coins for as long as most of us can remember. But that motto wasn't always there -- and if the U.S. Mint's fourth Chief Engraver, James Barton Longacre, had gotten his may, we'd be seeing a slightly different phrase on our pocket change today! It all began during the Civil War, when Secretary of the Treasury Salmon P. Chase received numerous appeals asking to recognize God on U.S. coins. One idea came from the last stanza of "The Star Spangled Banner:" " . . . and this be our motto: In God is Our Trust." 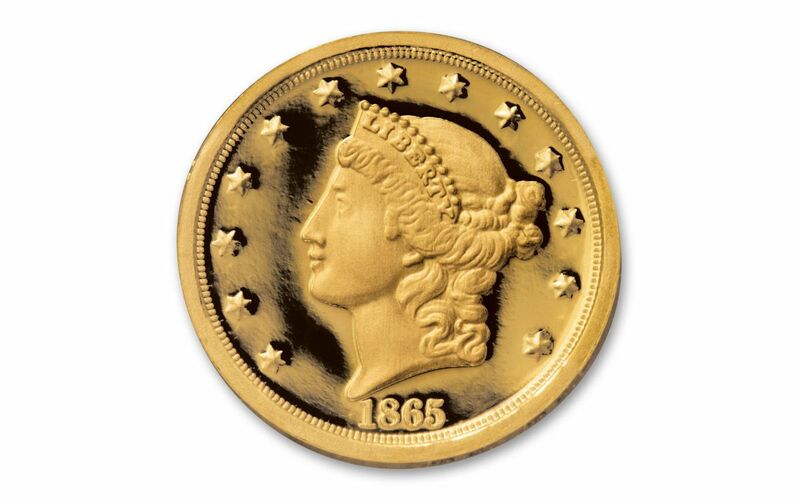 A number of other variations were also suggested, but Longacre's choice was "Our Trust is in God," which he included on a sketch for the 1865 Gold Double Eagle. For whatever reason the now familiar "In God We Trust" won out. But more than a century later, Longacre's original 1865 design, complete with his preferred motto, was discovered in the archives of the Smithsonian Institution®! 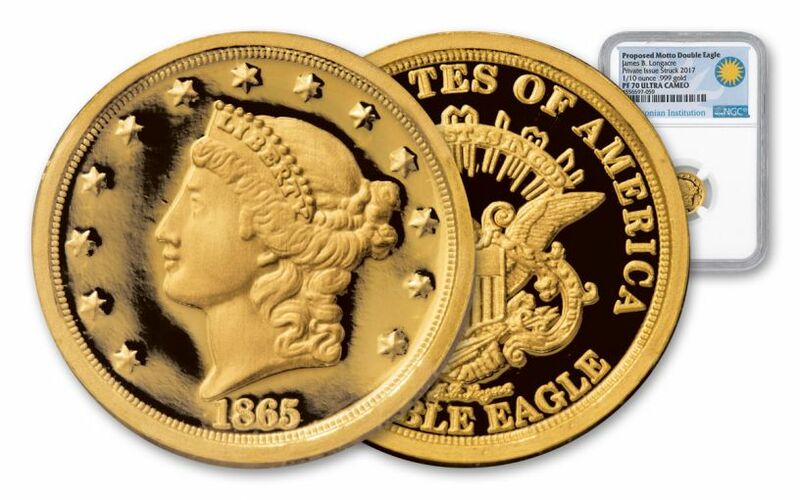 Now Longacre's "Proposed Motto" 1865 Double Eagle has gone from a sketch to an actual 2017 proof, privately struck in one-ounce of 99.9% pure gold! A DISCOVERY RESTORED!-- This proof features a Longacre's beautiful neo-classical portrait of Lady Liberty on one side and a heraldic eagle underneath the proposed motto on the other -- a 152-year-old design examined and approved by the Smithsonian's numismatic experts. PROOF-MINTED IN GORGEOUS GOLD-- Starting with hand-selected1/10-ounce planchets of 99.9% pure gold, each proof is struck multiple times using polished dies. Guided by experienced artisans, the process results in proofs with frosted and sharply-defined details that hover over lustrous, mirror-like fields. 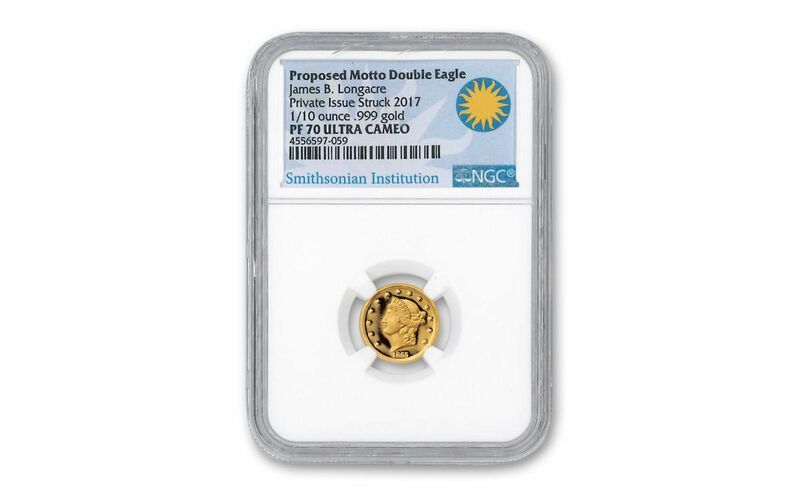 CERTIFIED FLAWLESS-- Your proof will also come certified Proof-70 Ultra Cameo (PF70 UC) by Numismatic Guaranty Corporation (NGC), a distinction that means your perfectly-graded 2017 Longacre 1865 Double Eagle Pattern Proof will have ZERO imperfections -- showing all features and fields exactly as the engraver and mint intended! In addition, your proof will be sonically sealed in an acrylic case with a special Smithsonian label, giving you the best in protection while granting clear sightlines into every beautiful detail. Finally, your proof will be accompanied by an official Smithsonian certificate of authenticity. AN EXCLUSIVE WITH AN EXTREMELY LIMITED MINTAGE -- This GovMint.com exclusive has a mintage of only 500 proofs! 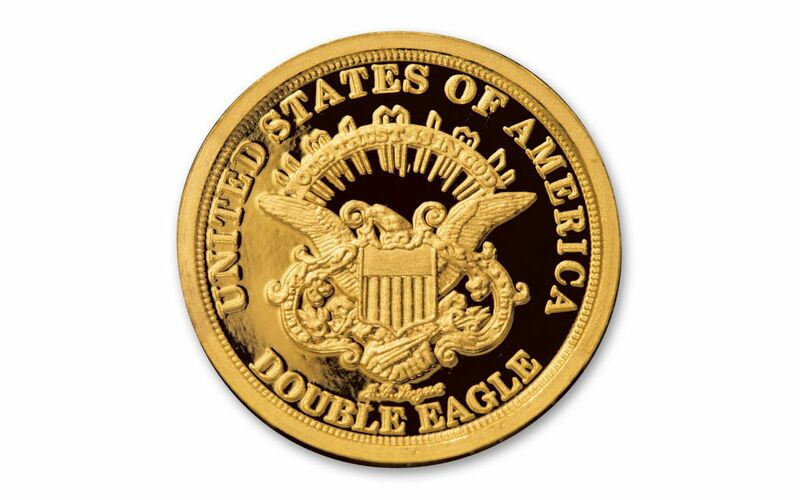 This tenth-ounce proof version of Longacre's "Proposed Motto" 1865 Gold Double Eagle represents the changing nature of American coinage -- and deserves an honored place in your collection. But don't wait too long! This limited-mintage treasure is sure to disappear quickly. Act now to secure yours today!